When we received in the mail the Snap Fashion Jewelry Studio kit, from Smart Lab Toys, my kids could not wait to check it out. We only had a few minutes after dinner and playing outside before we needed to head upstairs, so we agreed that we would only make a few snaps to start with. Making the snaps was (dare I say it?) a snap. The kit comes with a number of pre-cut fabric circles that you can quickly make into snaps. In addition, it comes with a guide that you can use to trace a circle, so you can cut out from any fabric to make your own unique snaps. The cutting guide even has a "hole" to let you view what will be on your button, so if you are using a highly patterned fabric, you can position it just so to get the look that you want. To make a snap, simply place the fabric "pretty side" down in the snap maker and place a snap dome over top of it. Lower the lever, pushing the dome and fabric down into position. Then, place a snap back onto the lever and push your fabric ends into the dome. Slowly lower it into place, so your fabric doesn't escape and then push down firmly. Use the button on the snap maker to release your snap. Then, attach your snap to your base and voila! The kit includes two ring bases, so your child can wear the snap as a ring. In addition. it includes five other bases that can be used to make any number of things. The snap bases have a slot through them, allowing you to slide it over ribbons, cords, etc to form bracelets and more. Fortunately, for the creative challenged, the kit comes with an idea book that has a number of different ideas on how to use the snaps for things like rings, bracelets, lockets, hair flair, key chain, cell phone charms, and more. In addition, it comes with tools to add flair to your snaps. There are 12 birthstone jewels that can be added to your snaps with glue. There are a number of transfers - including letters, soccer balls, Go Team and more, that with the use of acetone and a parent's assistance, can be added to the fabric on the snap to further personalize the snap. We haven't tried any of these yet. Like I said, we only made a couple of snaps that first evening, but the next morning, as soon as they were both ready to go, I found them in the kitchen making more snaps. My daughter simply had to have a bracelet and ring that coordinated. Before long, we had used up the fabric circles that came with the kit. We need to head to the fabric store to get some quilting squares or other scrap fabrics to make more snaps. At this time, they don't have refill kits available, but are planning to make them available by fall. In the meantime, additional supplies can be ordered through customer service. Would you like to try them out for yourselves? Right now, you can save 25% at Smart Lab Toys by entering BLOGBUZZ at checkout! This coupon code is valid through 6/30/11. 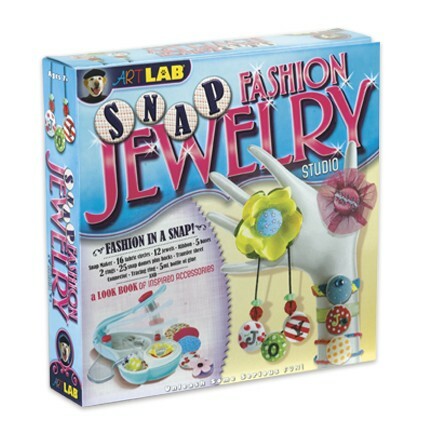 In addition to purchasing direct from SmartLab Toys, you can also find Snap Fashion Jewelry Studio at Amazon.com and select retailers. The kit retails for $24.99. Want to learn more? On their website, you can sign up for their newsletter and find free download-able activities for kids! You can also find SmartLab Toys on Facebook, like them for deals and discounts, playtime ideas and free stuff. You can also find SmartLab Toys on Twitter. In addition, I have the opportunity to give away ONE (1) SmartLab Toy, of your choice. To enter: Visit SmartLab Toys website and leave a comment on this post, letting me know what toy you would like to win, should you win the giveaway. Like SmartLab Toys on Facebook. Follow SmartLab Toys on Twitter. Please be sure to include your user name in the comment. Follow A Busy Mom of Two on Twitter. Please be sure to include your user name in the comment. Tweet about this giveaway. This can be once daily, please be sure to leave a link to the tweet in your comment. The Giveaway will run through May 19th at 6pm and is open to residents of the US/Canada only. Winner will be selected using Random.org random number generator. The winner will be contacted by e-mail (Please make sure that your email address is either in your comment or clearly visible on your profile or blog) and will have 48 hours to respond or a new winner may be selected. You may enter as many MamaBzz giveaways for this prize as you would like, but you may only win on one. No compensation was received for this post. All opinions expressed are my own. I received one Snap Fashion Jewelry Studio kit from SmartLab Toys through MamaBzz for my family to check out, for the purposes of sharing my review. In addition, SmartLab Toys is providing one item for the giveaway. I would really like the one you have because somebody likes jewlery ! The Glitter Spa Lab looks like so much fun! All natural SpaDay would be fun! the glitter spa lab looks cool. Would love to win the blast-off rocket racer for my boys. Thanks for the chance to win! The blast off rocket would be fun for hubby and son but would let son pick if we won. I like the blast-off rocket racer. The remote control rocket looks like a blast (pardon the pun)! I would like to win the secret formula lab. All my kids would like that.